Hi Lynn, When I read your post I was amazed. We wrote about quite similar things today. The Holy Spirit is working to get the message out about hope and renewal. So many need to have hope. Bless you. Lynn, this is beautiful. Just a great reminder. Love your blog design! Isn’t that fun, Patti? Will be sure to hop over and read yours! Thanks so much for the comment! Blessings to you! Debra, thank you so much! You make my heart happy. Bless you! Thank you so much, Traci! I appreciate it. Blessings! Believe it or not, I needed to hear this today. We all travel through the winter season waiting on the spring. Thank you for this post sister in Christ. What a wonderful post, Lynn, almost poetic the way you described life in spite of the appearance of lifelessness. 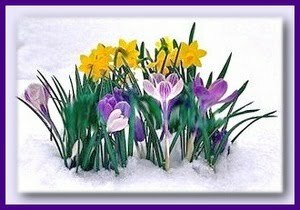 My biology professor in Christian college liked to say the “death” of winter and “resurrection” of spring reflects Jesus Christ. I’ve always loved it. Good post, offering hope and renewal. Such a needed message today. P.S. My guest on my online radio show today was Debbie Taylor Williams, author of The Plan A Woman in a Plan B World: What To Do When Life Doesn’t Go According to Plan. She’s giving away a copy of her book, Lynn, and I haven’t had many entries. So far. If you have a moment, bog over to my blog and leave a comment to enter the giveaway. Thank you Lynn for yet another post of comfort and encouragement, such uplifting words, timely… as always my friend. ML, may the beauty of your spring season blossom forth without hesitation. Thank you so much for stopping by. Blessings to you! Wow! Thank you so much, Victor! You bless me! Blessings to you! Thanks so much for taking time to visit and comment, Warren. I deeply appreciate it. Be blessed! Done, Flucy, my sweet friend! Love you! Marja, sweetie, you always warm my heart! Thank you. Love you! Isn’t it great spring renews us? Love your encouraging words. Thanks so much, sweet Sheila! I appreciate it! Bless you! BEAUTIFUL, Lynn! Just beautiful! What a blessing to witness God’s amazing promises of hope, rebirth and renewal all around us. We only need look to discover blessing upon multiplied blessing. Amen, Cindee! And thank you so much. You’ve blessed me. I deeply appreciate your kind words. Bless you! This was a lovely addition to the ‘swirling’ theme and very different from many of the other posts. thanks for this inspirational start to my day! It’s taken my quite a few years to understand that life is just a collection of seasons. Some are to be enjoyed, others endured. I like the thought of life still being there, even in the barren times. Thanks so much for stopping by, Tracy! I appreciate your kind words. Blessings to you! Thank you so much, Tamera! I’m so honored. Bless you! Thanks so much, Chris! Bless you! Thank you so much, Billy-boy! I am always honored to have you visit! Blessings to you! Wow what a great post. I am new to your blog. So glad that I found it!! Hey, Alicia! Thanks so much! I’m so happy you dropped by! Hope to see you again! Blessings to you! You used some very poetic description in this post which made it quite vivid Lyn. Thank you also for the encouragement about renewal in our lives. Thank you so much, Adam! I deeply appreciate your kind words. Bless you! Beautiful post, Lynn! Spring is such a wonderful time of renewal and hope. It’s a beautiful season of life as well as nature. Thank you, dear Connie. I always appreciate hearing from you. Bless you.